^ 樞機團會在教宗選舉秘密會議前決定其開始時間及第一天選舉會有多少輪投票，而每日只有最多四輪投票（每日上午及下午分別只有最多兩輪投票）。如果每日四輪投票後都沒有選出新教宗，西斯汀禮拜堂每日只會最多發放兩次黑煙信號（上午和下午各一次）。若於上午第二輪或下午第二輪投票中選出新教宗，那上午兩輪投票或下午兩輪投票的選票將於上午或下午所有投票完成後一併燃燒，發出白煙信號。 Conclave smoke signal timetable. （原始内容存档于2013-03-16）. ^ 每日上午只會進行兩次投票，如沒有樞機在每兩輪投票中得到足夠的票數成為新教宗，那麼該兩輪投票的選票將會一起燃燒，意味着只會發放一次黑煙信號。故此如果每日四輪投票後都沒有選出新教宗，西斯汀禮拜堂每日最多發放兩次黑煙信號（上午和下午各一次）。若於上午第二輪（全日第二輪）投票中選出新教宗，上午兩輪投票的選票將於早上兩輪投票後一併燃燒，發出白煙信號。 Conclave smoke signal timetable. （原始内容存档于2013-03-16）. ^ 每日下午只會進行兩次投票，如沒有樞機在每兩輪投票中得到足夠的票數成為新教宗，那麼該兩輪投票的選票將會一起燃燒，意味着只會發放一次黑煙信號。故此如果每日四輪投票後都沒有選出新教宗，西斯汀禮拜堂每日最多發放兩次黑煙信號（上午和下午各一次）。若於下午第二輪（全日第四輪）投票中選出新教宗，下午兩輪投票的選票將於下午兩輪投票後一併燃燒，發出白煙信號。 Conclave smoke signal timetable. （原始内容存档于2013-03-16）. ^ Vatican Radio - Pope Benedict XVI announces his resignation at end of month 互联网档案馆的存檔，存档日期2013-02-14. ^ BBC News - Pope Benedict XVI in shock resignation 互联网档案馆的存檔，存档日期2013-02-28. ^ Pope Benedict stepping down, cites poor health | Reuters 互联网档案馆的存檔，存档日期2013-02-15. ^ Can the Pope Retire? 互联网档案馆的存檔，存档日期2013-02-11. ^ Paul VI (20 November 1970). Ingravescentem Aetatem 互联网档案馆的存檔，存档日期2012-06-22. (in Latin). Motu proprio. Vatican City. ^ John Paul II (22 February 1996). Universi Dominici Gregis 互联网档案馆的存檔，存档日期2007-05-06.. Apostolic constitution. Vatican City: Vatican Publishing House. ^ Vatikan-Kenner: Schönborn als neuer Papst in „Poleposition“ - KURIER.at 互联网档案馆的存檔，存档日期2013-03-18. ^ Papst-Nachfolge: Italiens Medien sehen Schönborn in "Pole Position" - "Würde Kontinuität mit Benedikts Ansichten garantieren" - Wiener Zeitung Online 互联网档案馆的存檔，存档日期2013-03-16. ^ Scherer, Sandri, Scola, Schönborn y Tagle, el enigma de los papables 互联网档案馆的存檔，存档日期2013-02-14. ^ 16.0 16.1 Donadio, Rachel; Povoledo, Elisabetta. Pope Resigns, with Church at Crossroads. New York Times. : A1, A11date=12 February 2013 [12 February 2013]. 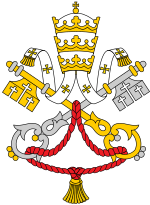 ^ Resources on current eligible papal electors. Canonlaw.info. [2013-03-12]. （原始内容存档于2013-03-07）. ^ Holden, Michael (25 February 2013). "Britain's Top Catholic Cleric Resigns, Won't Elect New Pope" 互联网档案馆的存檔，存档日期2015-05-09.. Reuters. Retrieved 28 February 2013.